petition: Save local sportscasters: Stop the Sinclair-Tribune merger! Save local sportscasters: Stop the Sinclair-Tribune merger! The pending takeover of Illinois-based Tribune Media by Baltimore-based Sinclair Broadcasting poses a severe threat to the ability of Illinois sports fans to watch their local high school, college, and professional games. Sinclair in the past has bought stations, fired the local sportscasters, and moved operations to Baltimore, where a stuffed shirt reads sports scores from thousands of miles away. Sinclair also has a history of taking down its programming during fee disputes with pay-TV distributors, often around sporting events, in order to demand higher payments. Fans either lose the ability to watch games, end up paying more, or both. It's a bad deal for sports fans. But there&apos;s one sports community perhaps at the greatest risk from a Sinclair-Tribune merger — WGN's. Sinclair is threatening the jobs of local WGN Chicago sportscasters Dan Roan, Pat Tomasulo, and Lauren Magiera. 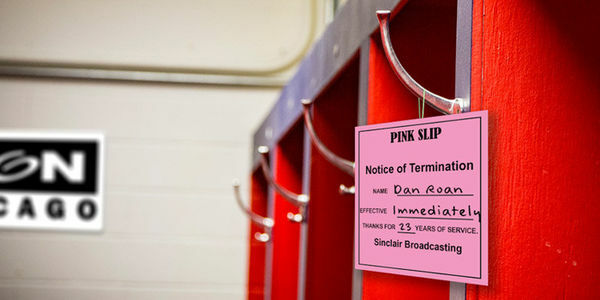 Without their voices on the air, Chicago sports fans will be left in the dark on the sports news. If the past is any indicator, Chicagoland sports fans can expect worse coverage, or none at all, of local high school and college games. We must speak out against a merger that imperils both fans and sportscasters alike. Several Attorneys General, including General Madigan and General Frosh of Maryland — Sinclair's home state — are leading the resistance. Now it's time for General Madigan to take the action that Washington, D.C. is failing to take: block the merger.